It’s that time of year again; everyone is making their New Year’s resolutions. It’s estimated that 21.4 percent of resolutions for the New Year involve weight loss and healthy eating habits. Unfortunately, about 80 percent of New Year’s resolutions fail by February, with only about 8 percent of people ever actually accomplishing their goals. Changing your eating habits to lose weight can be hard enough as it is. Plus, there is no one size fits all when it comes to dieting. Something that worked great for your coworker isn’t necessarily going to work for you, which can lead to a lot of frustration, disappointment and, ultimately, abandonment of your weight loss goal. Make this year different. Don’t just jump into a diet without a plan of action for how to get rid of bad habits. In order to avoid doing that, though, you need to better understand yourself, your habits and how to change them. Research has shown that you’ll have more success with breaking bad habits if you replace them with healthy alternatives. 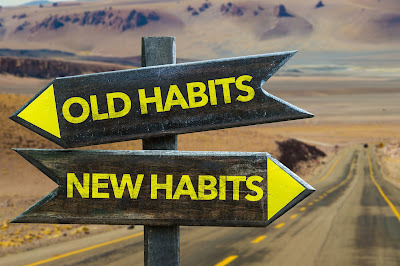 We’re all creatures of habit and comfort, so it can be really hard to change a behavior that’s so familiar, but understanding exactly what a habit is first will help you replace any bad habit with something great. So what exactly is a habit? Charles Duhigg, the Pulitzer-Prize-winning author of The Power of Habit, defined three parts of every habit: the Cue, the Routine and the Reward. The Cue refers to the thing that sets off your habit. It’s like a little signal to your brain that it’s time for that habit. The Routine refers to the fact that you get hooked on the consistency or habitualness of the act rather than just the act. Obviously, there are some exceptions to this. If your bad habit is tied to something physically addicting, then there are more factors at play than just the routine. The Reward refers to the positive outcome that motivates you to keep performing the habit – whether it’s a sugar high or a pat on the back for a job well done. Let’s say your bad eating habit is over-snacking when you watch TV. Your cue might be seeing food commercials on TV that prompt you to eat a handful of pretzels. The automatic, unintentional act of eating the handful of pretzels is the routine. The reward is the satisfaction you experience from eating foods, particularly sugars and carbohydrates. Similar to the theory expressed in The Power of Habit, the “Habit Replacement Loop” (HRL) is used by behavior psychologists to help their clients form and maintain new, healthy habits. The HRL emphasizes three aspects for forming good habits: awareness, focus and conscious repetition. Awareness – You need to be aware of a habit before you can change it. Understanding why a habit is bad, how it’s triggered and how it’s reinforced will only make you more aware of it and more likely to replace it. Using Duhigg’s breakdown of a habit, identify your worst habits for weight loss through the cues, routines and rewards. Write them out, and come up with healthy habits to replace each of them. For example, let’s stick with the bad habit of over-snacking while watching TV. You would keep the same cue (seeing a commercial for food), but now when you see it, you do 10 squats instead of eating a handful of pretzels. The reward for this new routine is the release of feel-good hormones, increased blood flow and an overall sense of satisfaction/accomplishment. Alternatively, if you’re not ready to incorporate an exercise, you could replace the handful of pretzels with a healthier snack like carrots or a ShapeWise Chocolate Chew. Whatever you choose, make sure you’re building healthy habits to lose weight. You want to be aware of your cues, routines and rewards to help you develop a realistic plan. However, planning a new routine is different from implementing it. That’s where the second aspect of the Habit Replacement Loop comes into play. Focus – This can be the biggest hurdle for a lot of people because it requires memory, motivation and effort to realize your cue, recall your new routine and really apply it. There are a couple of things you can do here to help. Visualizing an activity is actually almost as good as physically practicing it! It’s called psycho-visualization. Basically, you just visualize your new routine as much as you can to help make it easier for you to actually recall it in the moment. The more visual practice, the easier the focus will come when you’re in the game. Another great tool is using external visual reminders around your home (or even on your body, like a Fitbit, if applicable). For example, you could hang an exercise chart up above your TV so you have a visual to help prompt you to implement your new routine. Make sure that you choose a visual reminder that makes sense for you and your goals. Conscious Repetition – Each time you make the conscious decision to react to your cue with your new routine, the habit you’re forming is strengthened. This process can be a little lackluster to start; for example, if you’re replacing an eating habit with a non-eating habit, then it can feel less satisfying and, therefore, it can be a little harder to feel motivated. Stay with it, though. The more you do that behavior, the more likely it’ll stick and become effortless. Turning a bad habit that contributes to weight gain into one that helps you lose weight is one of the best things you can do for yourself this upcoming year. Not only will you reduce your calorie and sugar intake, but you’ll increase your fat burning in one fell swoop! Need ideas? Learn more helpful tips for losing weight this New Year here and how to stick to your resolution here. Between our healthy, low-calorie products and personalized dietary guidelines, and your new healthy habits to lose weight, you’ll be sure to start the New Year off right and soar through your 2018 weight loss goals. Just remember: Replace Bad Habits With Great Habits.